The Natures Head Dry Composting Toilet Is Still Going Strong! Do you want a cost-effective method of living off the grid with your toileting needs? Are you looking for a composting toilet that can give you a better traditional experience? Nature’s Head has created an outstanding dry composting toilet that you’re going to want to see to believe. UPDATE: Be Sure To Watch How To Install Your Natures Head Dry Composting Toilet Video Below. Plus, a great user submitted video review of this composting toilet. 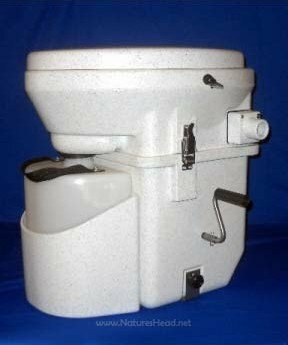 What Are The Bullet Points On This Natures Head Dry Composting Toilet With Crank Handle? It’s incredibly user friendly and features a fully molded design that replicates the look and feel of a traditional toilet. It offers a crank agitator to assist with the composting process and works with a 12v power plug if you’ve got some solar energy coming your way. It’s also priced for less than $999 on Amazon today, which means it is 50% less than similar makes and models. What Kind of Features Does This Nature’s Head Dry Composting Toilet Have? a 5 foot vent hose with a bottle cap is included so that the Nature’s Head composting toilet can be installed indoors or out based on your preferences. If you weren’t actually looking at the toilet, you wouldn’t believe that it isn’t a standard flush toilet. The look and feel of the toilet is good and the high quality molded plastic of the seat is really easy to maintain. All in all, this is definitely a good value purchase! Is There an Advantage To Using This Composting Toilet? Outside of the lifestyle advantages that this toilet can provide, it is highly flexible in its design and can be used in an RV, your basement, or even in a workshop if you wanted because it replicates the traditional toilet look. There isn’t a holding tank to worry about and you won’t have to worry about emergency pumpouts. You simply put in the peat or your preferred composting material and you’re ready to go. There really isn’t something bad to say about this composting toilet. You can dry camp and not have to worry about dumping. It is highly affordable, works well, and will limit your water usage quite a lot. You can even connect it to a 12v battery if you prefer. With all of these advantages, the Nature’s Head composting toilet definitely gets our recommendation today! Click here to compare prices on Amazon and get the best price on the Natures Head Dry Composting Toilet. User Steve Spence talks about the benefits of this composting toilet. Great job Steve! Ready to install your new Natures Head Dry Composting Toilet? This video will help! Looking for more outdoor or Composting Toilet Ideas?